Around the holidays, Cutting Edge Stencils contacted me and asked if I would be interested in reviewing one of their stencils. Since I was already a fan and own one of their stencils, of course I said yes! 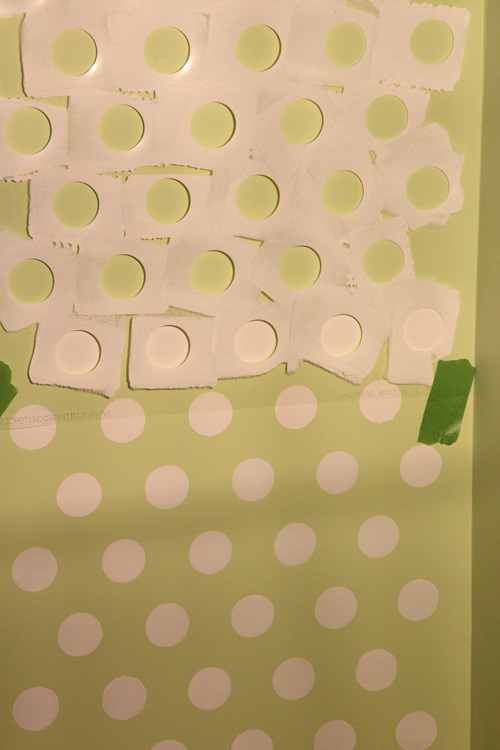 Problem was that we hadn’t yet started the nursery and I wanted to stencil the ceiling. 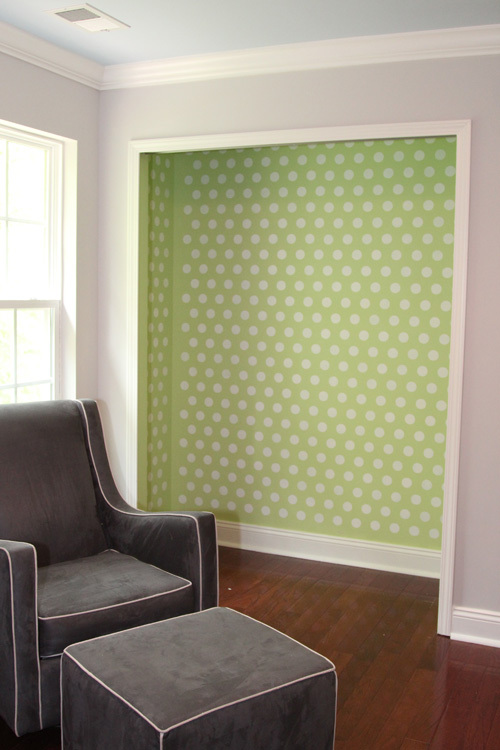 Thankfully, they told me I could hold off on my review until I was ready and I chose their Polka Dot Allover Stencil in the small scale size. Fast forward like, 5 months. 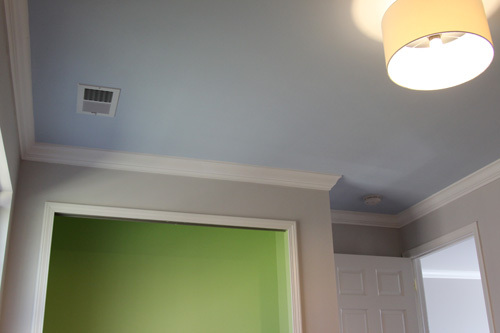 We ended up taking much longer than expected on the nursery and after painting the ceiling a dreamy blue, I decided that I didn’t want to stencil it. 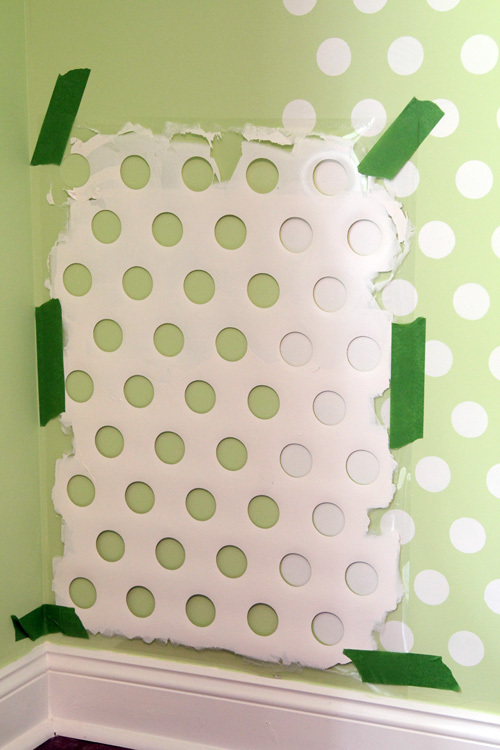 I focused my stencil attention on the green closet instead. It took us a while after we painted to get to the closet, but this week I was finally able to spend some time on stenciling. 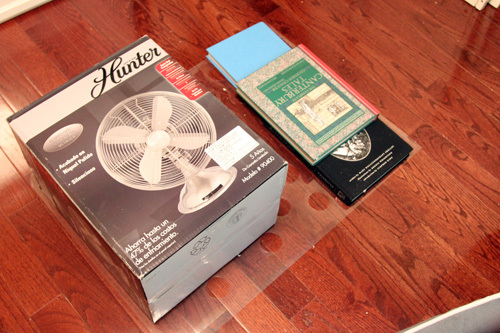 Cutting Edge Stencils sent me everything I could possibly need to tackle this…. 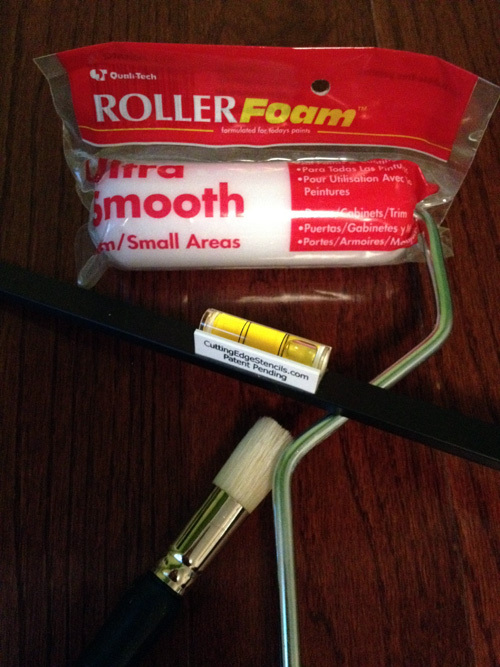 the stencil, a foam roller, a brush and a level. The stencil also came with detailed directions, which is how I realized that I was supposed to remove the stencil from the shipping tube immediately and store it flat. Whoops. But, like I said the other day, I flattened it with some books for a day or two and it was fine. Yeah I taped the heck out of that first stencil. Since I started in the bottom corner of the closet, I decided not to use the level. It snapped on easily and worked well, but I quickly learned that the closet is not at all level! The baseboards are uneven, the side of the wall gets more narrow at the top and the level showed that it was slightly off. So I just started by lining the stencil up with the baseboard, as close to the corner as I could get and then just aligned the rest of my stencils based off of this first one. For my method, I first started with the brush. I just personally prefer holding a brush rather than a roller so I dabbed some paint on the first two rows of dots. It was looking a little sponge painted, so I decided to try the roller on the next rows. Here is the difference between the two finishes. I decided to go with the rolling for a more consistent paint application. You can also see from the above picture that my stencil is not completely touching the wall. I was worried this would be a problem with bleed through and that I would need the spray adhesive but it did not cause any problems! 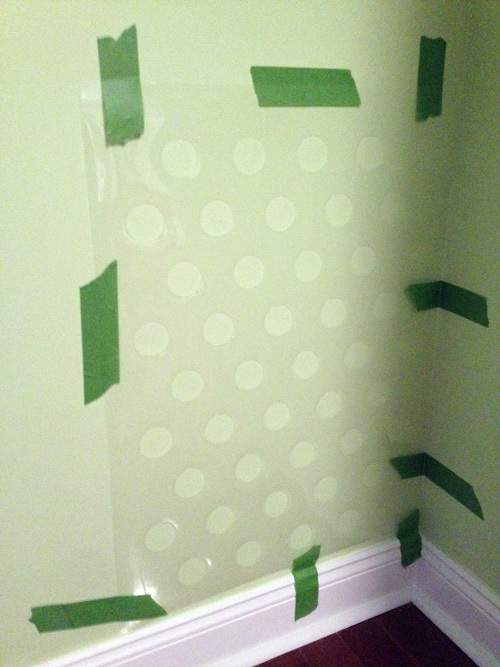 Once I rolled over a dot, the pressure applied pushed the plastic stencil flush to the wall for a clean line. The absolute key to this process? Don’t overload your roller. 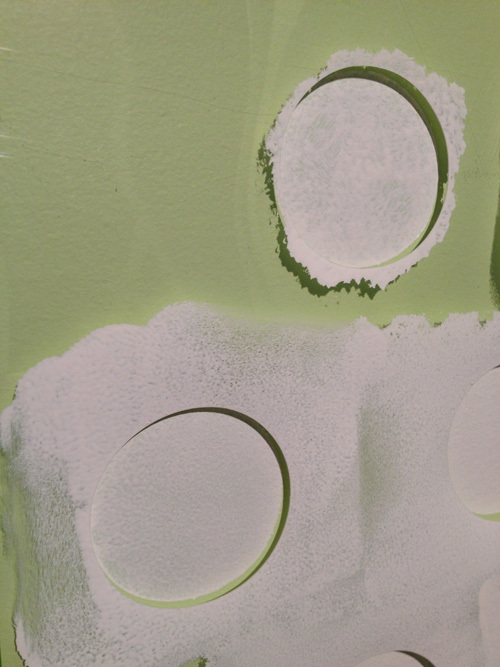 I did two very thin coats of paint on each dot– too much paint at once will cause bleed through. Once it was time for the next stencil, I just overlapped the top row of the stencil I just did with the bottom row of the one I was about to start. I also gave it about 5-10 minutes between moving the stencil so that the outside was not soaking wet with paint when I peeled it off the wall. Mostly to protect my shirt, since my belly protrudes and pulling the stencil off made it smack into my body. It also gave me a break in between rolling. I even had Mike do most of the repositioning and taping so that I got a good 15 mins between each rolling session. I had no issues whatsoever with paint being on the back of the stencil, so I didn’t have to worry about it being completely dry when I moved it. I repeated sheets like this until I got to the point where I could no longer fit a whole sheet. Then, I just overlapped the amount of dots I needed to get as close to the corners as I could. Once I got to the top, I only needed an extra row of dots to hit the ceiling. 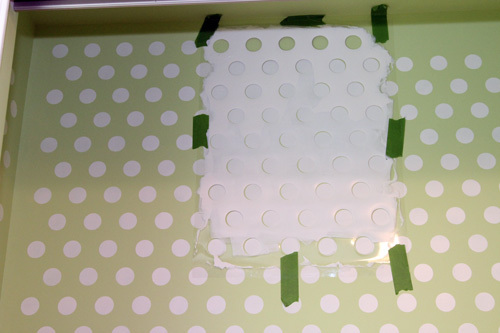 So I aligned my stencil with the existing dots and only had to paint the top row. Then, I was all done! The stencil was really pretty much fool proof to use. My dots came out clean with minimal effort. 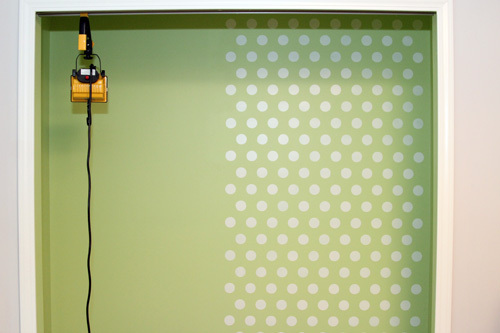 This particular stencil was extremely forgiving when it came to aligning and overlapping areas. 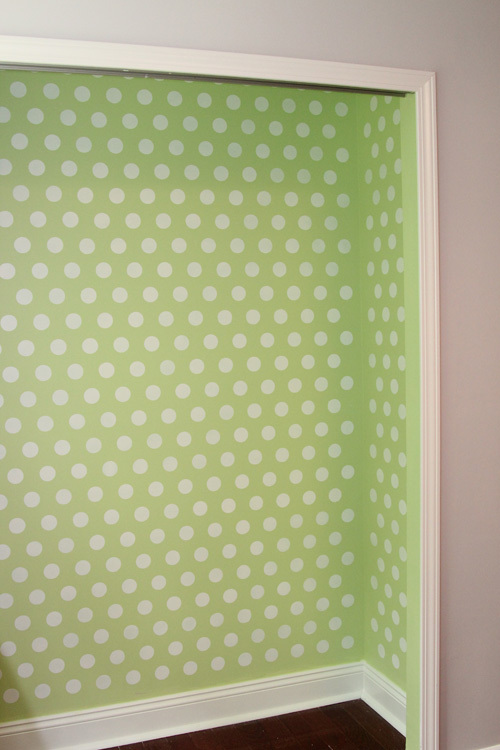 The dot color is the same paint as our trim in the room– Olympic’s Crumb Cookie in a semi-gloss finish. I’m so happy that I decided to stencil the closet and I can’t wait to see it with the closet organization system all in. Hopefully that piece that we’re missing arrives soon so we can get this all settled and packed with clothes! Special thanks to Cutting Edge Stencils for sending me the stencil, roller, brush, level and inspiration. I would definitely recommend their stencils to anyone interested, the options they have are seriously endless and droolworthy. Repetitive disclosure: I received the supplies necessary for this project in exchange for a product review. All opinions expressed are 100% mine. Holy crap, this looks PERFECT. Are you kinda sad you have to put clothes in it now? Hah. That’s AWESOME! We’ve been thinking about quatrefoil’in our dining room once we finish the paneling. 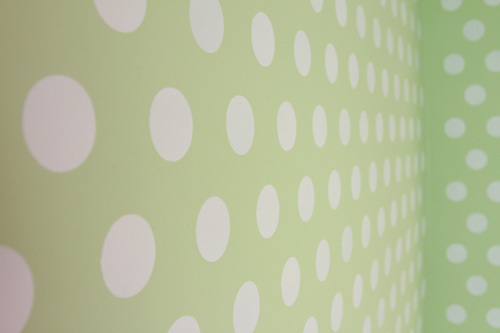 We’re concerned that the stencil thing may be too hard and were considering wall paper. After reading this post, I’m convinced it’s do-able and will result in a quality look. I love how this turned out! I can’t wait to see all the little clothes hanging up in there! Oh your description of your the stencil sticking to your belly cracked me up! 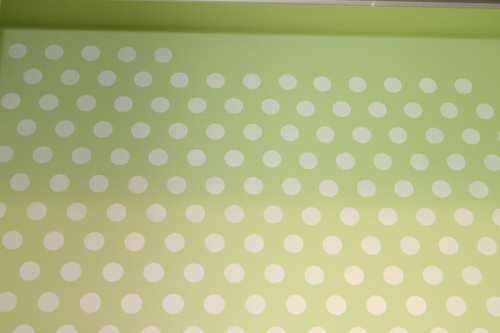 It looks so fun and fresh, I never even knew they had a polka dot version, that is a really great pattern. It looks wonderful, and will be such a cute addition to the finished nursery. Job well done! Rebecca, the closet looks awesome! I love it! Such a great idea, disappointed I did not see this before I just finished the girl’s playroom. 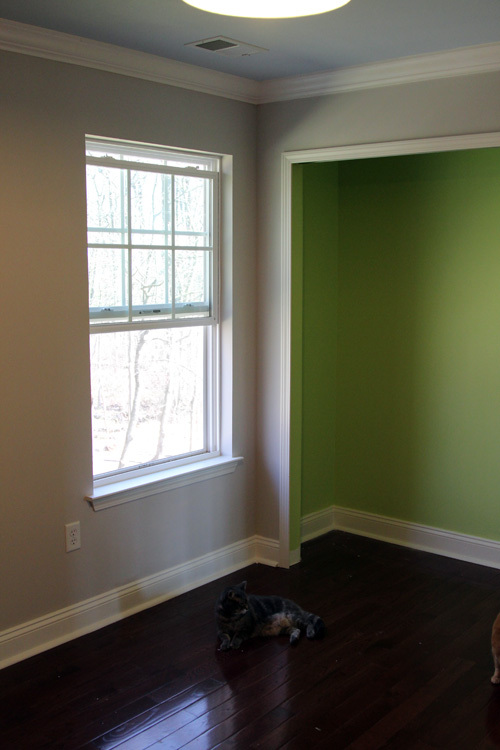 What paint/color is the green…. such a great color! face in their lives. If you want to drive, you’ll have to buy yourself a car. The simple ideas below will help you turn the car buying process into something you not only can handle, but that you are a master of. You don’t must dread spending all of money whenever you go shopping. You can get the knowledge it takes to hold on to money when you use carrabba s coupons correctly. You just require to find out exactly where to discover the proper carrabba s coupons. Read beneath to get some useful suggestions about carrabba s discount coupons and saving cash once you shop. I love the finished product! 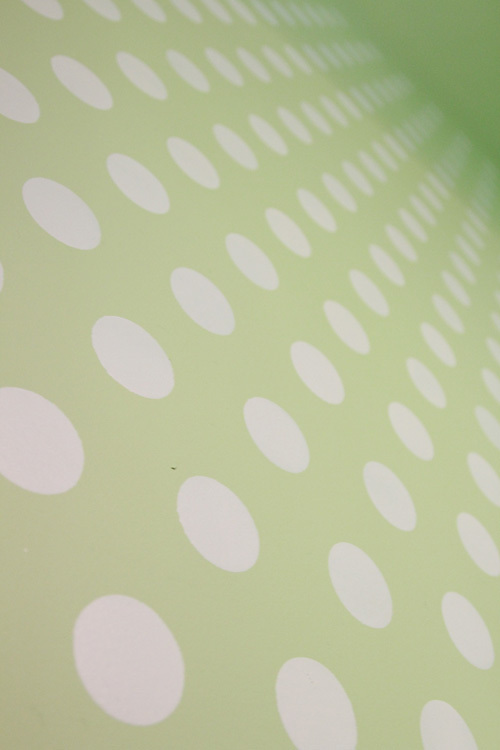 I’m thinking about doing polka dots on the ceiling in my nursery, but I can’t decide on the size of the dots. Realmente a minha casa, digo a parede que estava assim…só …apareceu e ficou muito linda , pois além de destacar deu um up …Isto é simplesmente otimo. After looking at a few of the articles on your web page, I really appreciate your way of writing a blog. That looks like a very time consuming endeavour, but the end result is amazing! 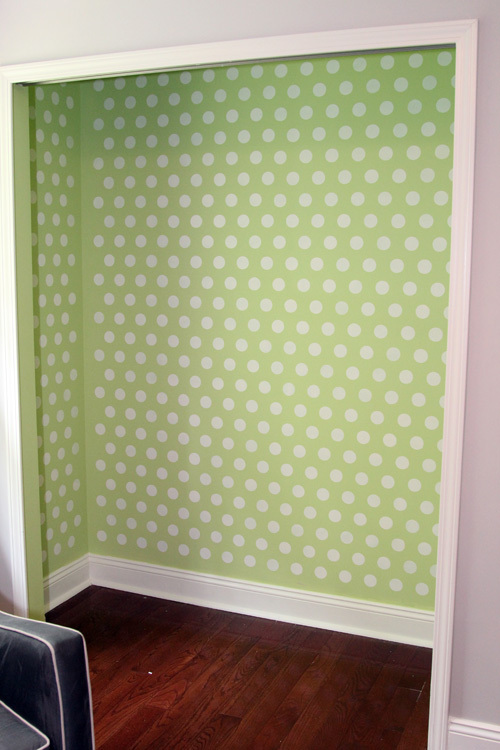 You definitely have an eye to detail, the dots are perfectly symmetrical and the closet looks great. The only thing left is to keep the clutter away! Professional tile cleaning services in Melbourne. Residential and commercial services available. Tile restoration services and grout restoration services. That’s the perfect soft green to soothe the eyes. Contemplating a similar colour scheme around the garden of my home… Thank you for the inspiration!